How to Draw the Fun and Easy Way! For me, Drawing step by step was the best method to learn how to draw because I could see and follow the artist as they created their pictures. When I was learning to draw nothing helped me more than being able to copy the work of someone else. If you are looking for similar step by step material then you have come to the right place! When you are beginning it's best to start off with something easy to build up your confidence. I personally like this easy-first, hard-later approach when I am trying to do anything new - be it a new technique, or something I've never tried before. If you start off trying to do something that is too far above your skill level, you will probably get frustrated and give up! With that thought in mind I have rated the following step by step guides with a difficulty rating. Use whichever one you wish, but try to choose one that is a good match to your current drawing skill, but don't be afraid to look at the guides above your current skill as well. Start learning how to draw horses by watching this video and tips that will show you how to draw a realistic horse head. Follow this lesson on butterfly drawing to learn some drawing techniques that you can then apply to drawing anything you like. 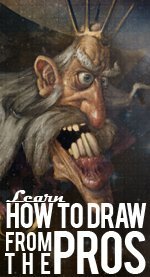 This lesson is highly recommended to anyone trying to draw in a realistic style. In this lesson you'll learn how to look at a photo to determine which part of the face you should exaggerate and then watch a video as the example photo becomes a caricature. Roses aren't impossible to draw, but they do take a little work. Drawing step by step you will learn how to create great looking roses every time. Learn more about the basics of caricature, and take the quick art test to see if you have the artistic ability to draw a caricature like the one on this page. Once you've done the test watch the video to see how the simple strokes you drew can be combined into something great. Learn how to turn simple shapes in to a full scale drawing of a dog. You can even use this tutorial to draw all different types of dogs. Ever wanted to know how to draw great looking clouds? Let me show you how with this easy to follow video lesson. You can also follow along with the step by step written guide.